This coming Saturday, January 6, 2018, at 1 p.m., the Humboldt County Historical Society presents a Mattole Valley Historical Society slideshow. It is a free event, held in the Conference Room of the main branch (Eureka) of the Humboldt Co. Library, at 1313 Third St (follow 3rd Street east until you’ve passed the Carson Mansion. You can’t miss the beautiful new library building with ample parking out front. The Conference Room is to the left of the lobby just as you enter). The official press release for the event reads, in part, “Ms. Cooskey will show an array of historical photos showing the promise, and the disappointments, of the Mattole Valley to settlers, visitors, and entrepreneurs. The Mattole Valley is a land of extremes, with extraordinary beauty on one side and fickle natural forces on the other.” This is why I’m calling the show “Sunshine and Rain”–it’s not only true that we enjoy plenty of both of those actual boons in the Valley, but our fortunes here seem to drift from one state to the other, often quite indifferent to our intentions. But then, if we stay here long enough, we strike a balance and begin to feel that a lot of sunshine and a drenching of rain are just the tickets to the comfort and happiness of a real home. Closer to nature and closer to neighbors than is always comfortable, but that’s what makes the roots we put down feel real. 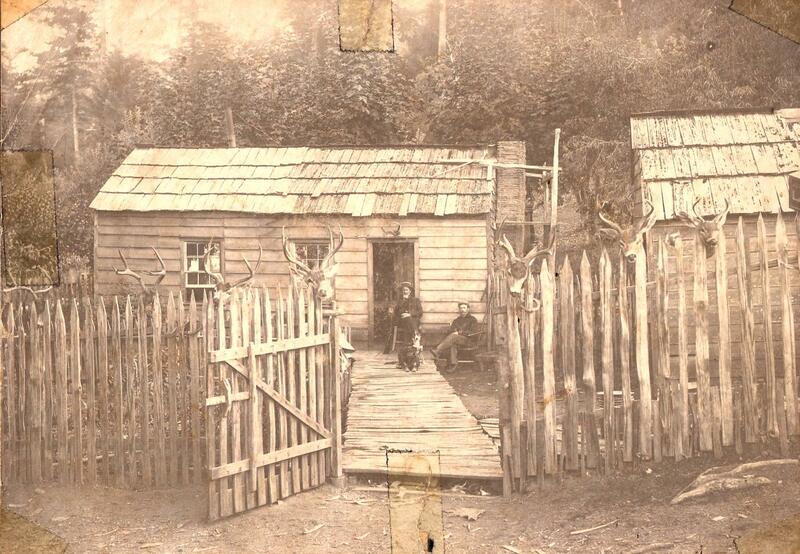 A hunting cabin somewhere out in the Cooskie Range, as they used to say. From Dayton Titus’s album. I have about 130 slides. Many have been seen in the MVHS newsletter, on the walls of the Grange, or on this blog… but several should be new to you. Please come by the library on Saturday afternoon. The show should last about an hour. If I or we get to talking too much, just holler, “Slide!” and I’ll move on to the next image. That’s what it’s all about! Old pictures of the Mattole Valley. P.S. I’m really sorry about being such a negligent blogger. I will try to put up some new material here soon. Thank you, loyal history followers!